The new entry located on the south-eastern portion of the campus was completed in January of 1999. It was designed to provide a new school identity to the community, security, and as a link/control point to the previously isolated parking areas . 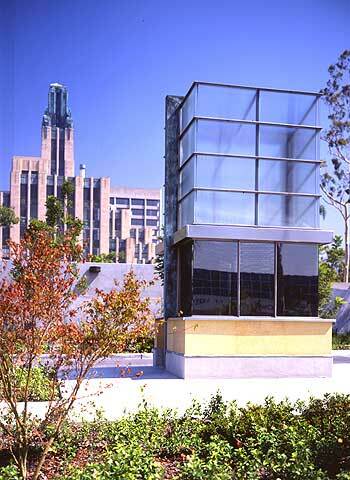 The entrance consists of a 'lantern-like' security kiosk, a 6 foot high perimeter wall and gateway, a vehicular ramp to the existing parking structure, lighting and landscaping. Concrete, block, kasato stone, copper, glass and stainless steel were chosen for durability and performance.